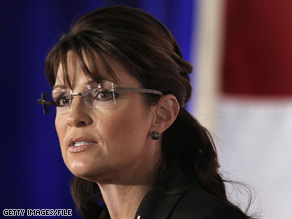 Will Sarah Palin face a primary challenge from Ted Stevens in 2010? WASHINGTON (CNN) - Now that the corruption case against former Sen. Ted Stevens has been dropped, Alaska Rep. Don Young wants Stevens to run for governor - a move that would set up a Republican primary between the veteran lawmaker and Sarah Palin, if she decides to seek a second term in 2010. "Personally I'd like to see him run for governor, and that's my personal feeling," Young told the Alaska Public Radio Network on Thursday. "So, we'll see what happens down the line. He probably won't, but I think that would be a great way to cap off a great career as being the governor of the state of Alaska." Stevens will be 87 years old by the time the next governor takes office in January 2011. Other top Alaska Republicans, including Palin and Alaska GOP chairman Randy Ruedrich, said Thursday that Democratic Sen. Mark Begich should step aside so a new vote can be held now that the charges against Stevens have been dropped by the Justice Department. Young dismissed those demands, calling them "a lot of noise." "Sen. Begich, in all due respect, won the race," he said. "There is no other recourse. He has taken office, he is now the new senator." Young and Palin aren't exactly political pals. Palin endorsed a Republican primary challenger against Young in 2008, and during her vice presidential campaign the Alaska governor refused to publicly back Young's re-election bid while federal investigators looked into his dealings with an oil company. Good Grief - I used to think visiting Alaska would be such a beautiful trip - the more I hear from these folks up there, the more I NEVER want to see the state. Who knew the people were such BLOCK HEADS. Young is testing the waters for his own run. It's unfortunate the lower states Americans didn't take Palin seriously. She's done great things in Alaska amid one of the most corrupt bi-partisan political systems in the USA, making lots of political foes along the way while trying to clean things up. People balked at her folksiness and wilderness priorities because she's different from Hollywood priorities. If you look closely you'll see that what she shook down the oil companies for was to benefit the people of Alaska (her job) not personal gain. Look real close and you'll see a female Teddy Roosevelt in the making. I'm all for somebody running against Palin, because she's corrupt and needs to get out of there... but Stevens? He's way too old and he's as corrupt as she is, almost. The Alaska GOP needs to run someone GOOD against Palin instead. If Rep. Young doesn't want Sarah Palin to be the Govenor of Alaska, he should run against her himself or find another candidate to support. In a Good and Honest U.S., they would hold a re-vote because the only reason Begich won was the lies and the scandal about Stevens that were instagated by the Democrats, even thought the Justice Dept was Republican. Holder new once the truth came out that the BOYS were in deep trouble if Stevens or his lawyers went afte them for deformation of character and slander. How would that look against the new and all perfect HOLDER???? But since Stevens is a Republican and NOT a cry-baby Democrat (like in Minnesota) , there will not be a re-vote. Democrats only scream and throw temper fits to get attention and to get people to give in to make them shut up – fact. Now that sme Democrats are being found unscrupulous, they are trying to HIDE them for view as they do not want the public to see how crooked they are. I want Sen. Begich to resign. democrats will do anything to cheat. Look at Barack Obama's senate seat. It is a disaster. Once they occupy the senate seat, they do not want to go. These guys have to go. let the show begin for 2010. the republicans "LOVE" themselves so much that i can't imagine why anyone will want to be a republican. am sure Mr Steven was let off because of his age and maybe connection. palin will be called to account for the things she said about him when she was running for vp. i don't see that old man letting her off the hook just like that. the unfortunate thing is that she will not have mccain on her side. am sure she can build an alliance with rush. can someone please tell me what is happening with the republican party? damn!!! Who cares about these wacky GOPers? Alaska could do much better. Wow! So Republicans in Alaska will have a choice between two politicians who have had corruption cases brought up against them? GO DEMOCRAT, ALASKA! looking forward to seeing them swing blue in 2012! Why are we discussing 2012?! None of these people are qualified or have enough skills to replace president Obama. It takes smarts, charisma, and having great interpersonal skills. Prez. Obama has it all!